The members of the French Parliament will put on their clothes 1000 pieces Bulgarian MARTENITSI (red and white knitted decoration) to demonstrate solidarity with the idea of the unjust sentenced to death Bulgarian medics and the Palestinian doctor in Libya. This event is coordinated with French deputes who are members of Communities of Nations for Peace – a UN department and of the organization itself. On Bulgarian side the event is organized by PR agency IMAGE ADVERTISING , as Promet Steel Company sponsors the initiative. Promet Steel company has a plant near Burgas and is a big producer of steel. 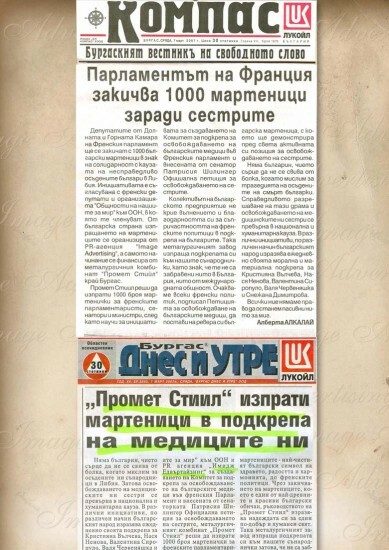 The company decided to send 1000 p. MARTENITSI to the French deputes, senators and ministers after it knew about the initiative of forming a Committee supporting the Bulgarian medics in the French Parliament and an Official Petition of liberation the Bulgarian medics which Patricia Schillinger a Senator has proposed. The employees of this Bulgarian plant appreciate the noble initiative of the French politicians. This way the plant joins the initiative as a sign that the nurses are not forgotten. We expect every French politician who has signed the Petition to put on her or his clothes the Bulgarian MARTENITSI and thus to demonstrate his positive position for the liberation of the Bulgarian nurses. Every Bulgarian is anxious about nurses’ fate and when thinking of their tragedy . Solving the case and the liberation of Kristiana Valcheva, Nasya Nenova,Valentina Siropulo, Valya Chervenyashka and Snejana Dimitrova turned to be a national human cause. We have no chance to remain inactive.